U.S. troops are involved in combat, counterterrorism or combat support missions in Iraq, Africa, the Philippines and elsewhere. This year marks the American military's 17th year in Afghanistan. 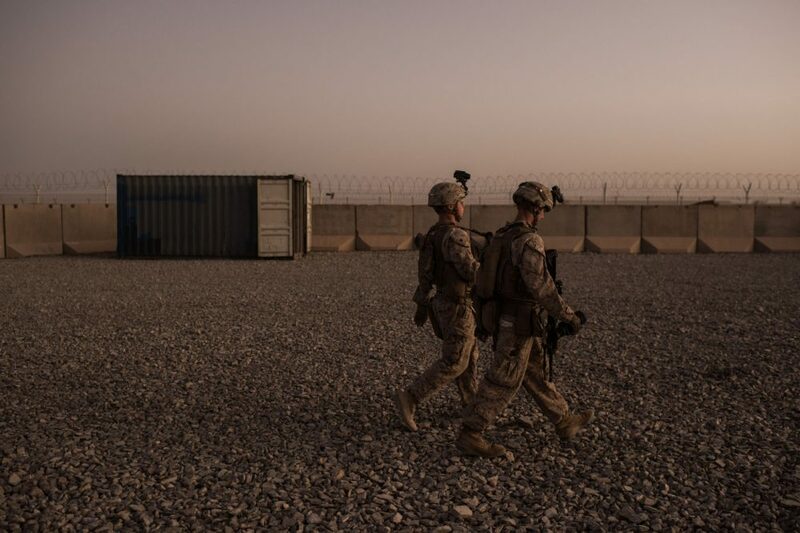 Former Marine and author Phil Klay (@PhilKlay) tells Here & Now's Eric Westervelt (@Ericnpr) the lack of clear mission, and the lack of debate about the fighting in American society, are having deleterious effects on troop morale. "I noticed, probably as early as 2011, guys in Afghanistan or coming back from Afghanistan, who found it incredibly difficult to articulate either what they expected the mission to achieve where they had been, or just frankly didn't really believe in the mission at all. I quote a sergeant in a unit that that suffered the highest casualty rate of any battalion in Afghanistan up to that point, and the sergeant was asked about the purpose of the of the war, and what it was, and he just said, 'This war is stupid. So what, our country's in it.' And I just started wondering, what does that do over time? And also, why is it that we as a nation are just unable to provide even minimally coherent military policy, such that the average guy on the ground could point to a public debate, and say, 'Here's the mission, this is how it's gonna be achievable, this is what success looks like.' "
"I think one of the things that is really disturbing to me is the degree to which public debate and accountability has fallen away." "I think one of the things that is really disturbing to me is the degree to which public debate and accountability has fallen away. So I was in Iraq in 2007. I was there as part of the surge that President Bush had ordered, where we increased the number of troops to Iraq. And at the time, the surge was hotly debated. In September, [U.S. Ambassador to Iraq] Ryan Crocker and Gen. David Petraeus came before Congress, they were grilled. And so there was a real effort on all sides of the debate to actually grapple with complex questions about what our military mission was, what it was supposed to achieve and whether we were achieving it. And then, there was a little bit more of that when President Obama announced the surge to Afghanistan, but very quickly — particularly as he was trying to pull troops back — public discussion of wars became very muted." "Yes, and this is something that I was concerned about while he was running. I actually had a chance to ask him a question during the campaign, and the question that I asked him was, you know, I said, look, over the past decade and a half, a lot of Marines and soldiers have fought and died taking back territory from insurgent groups in Iraq and Afghanistan, only to then leave and watch new insurgent groups spring back. And my question for him was, after the fall of ISIS, what was his plan for the region to ensure that didn't happen? And he didn't really have a answer, he kinda gave a long, rambling critique of President Obama's strategy, and then said that we should take the oil, which didn't make a lot of sense. "And instead, what we've seen is in many ways a continuation of the policy that we've had under Obama — a little bit more bombast coming from the commander in chief, and also ramping up some types of counterterror strikes. But nothing that would kind of cohere into a strategy. And the starkest example of the disconnect is, if you look at what military leaders have been saying for years, at this point, you have former chairmen of the Joint Chiefs of Staff, the current chairman of the Joint Chiefs of Staff, talking about the essential role that the State Department and U.S. Aid and other foreign aid programs will play. And what do we have? We have a commander in chief who ramps up military strikes, but is gutting the State Department, wants to gut foreign aid programs. And there's no sense of forming any kind of coherent strategy for the regions where we have battlefield successes, for handling the aftermath." "Yes, but I think it's hard when your elected leaders are avoiding that debate. And I think that's probably where it needs to start, because the actual problem is that we no longer have real accountability. And what I would like is, I think every two years, the president should have to go before Congress. He should have explain where we have troops in harm's way. He should have to explain why they're there, what the mission is, what the benchmarks for success are, so that in two years, he'll have to justify what he said. And also, what resources we would need in order to be successful. And then every member of Congress should have to vote on that, and actually stand up for what they believe and provide some kind of oversight, which is constitutionally what Congress is supposed to be doing." "I think it would, because if you forced public debate, you would then be forcing every member of Congress to actually take a stand, and we would then only have wars that the American people and their representatives had actually got behind. And you would also, I think, have a much better chance of providing clear, coherent missions. "At the very least, if Congress is going to be involved, if the president is gonna be forced to regularly articulate what we're doing and why, that will provide clear public statements that service members can actually look to, and use to understand the purpose of their own mission and what they're doing. And I actually felt that when I was in Iraq during the surge, because I could actually look at the debates in Congress and see what people were saying, measure them against my own experience of what was happening on the ground and use that to come to a better understanding of my role and how what I was doing was an extension of the will of the American people."